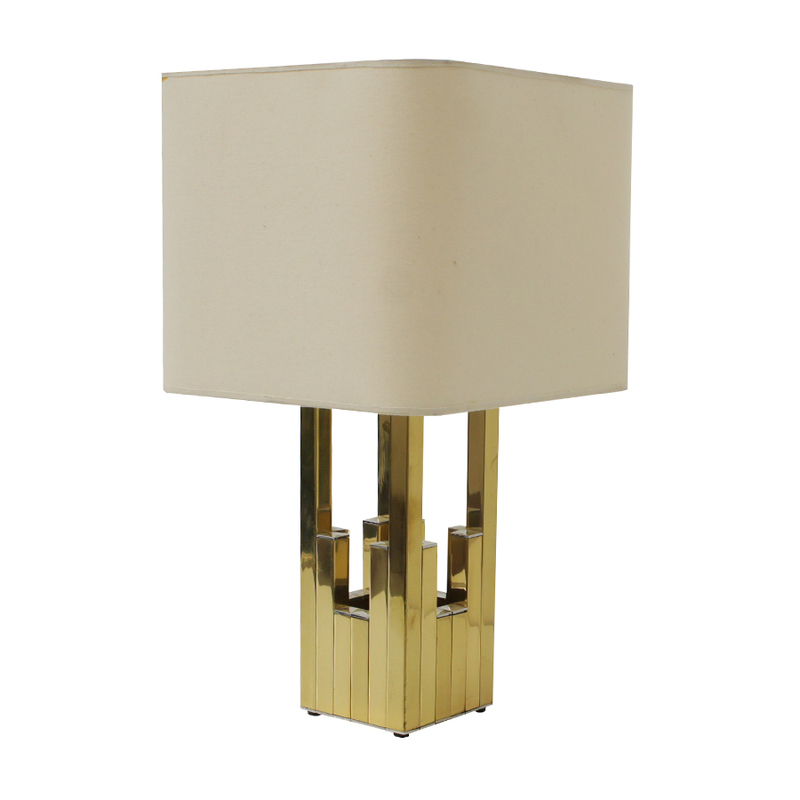 This geometric table lamp in gold metal was produced by Lumica and designed by Willy Rizzo. 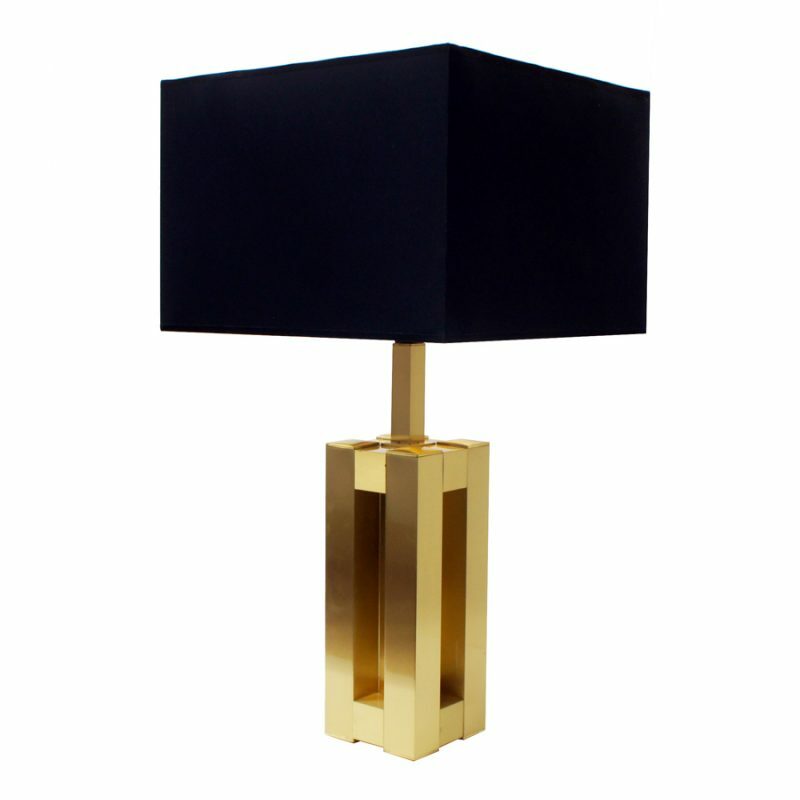 The lampshade is in black cotton, with gold paper inside. 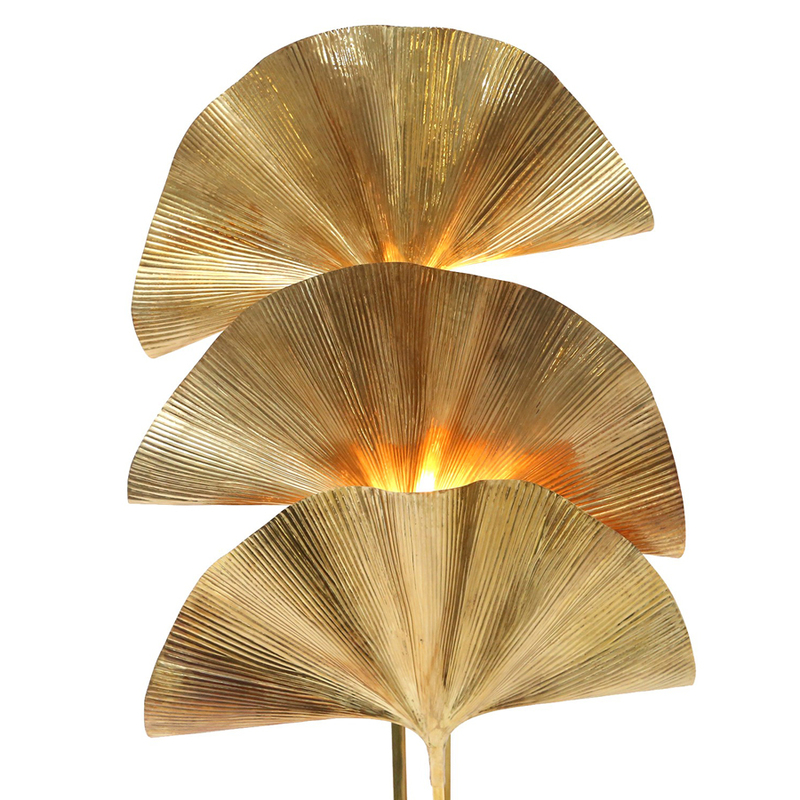 A gilt metal palm tree floor light by German designer Hans Kogl, in an age-patinated condition with three gold mirrored light bulbs. 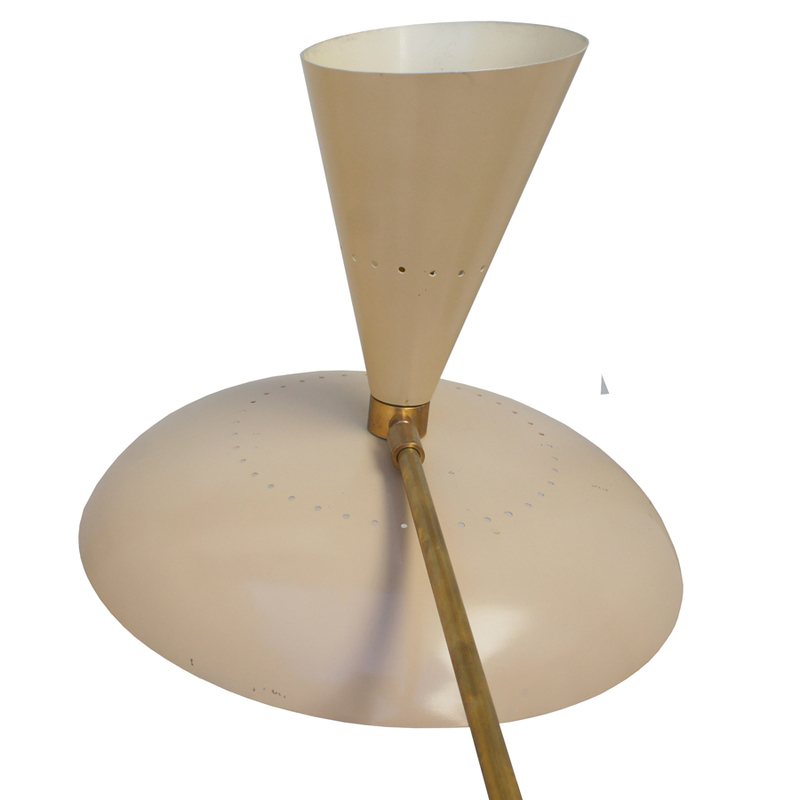 Vintage PH 3/4 lamp by Louis Poulsen, original design by Poul Henningsen to diffuse softly light. It is lacquered in white. 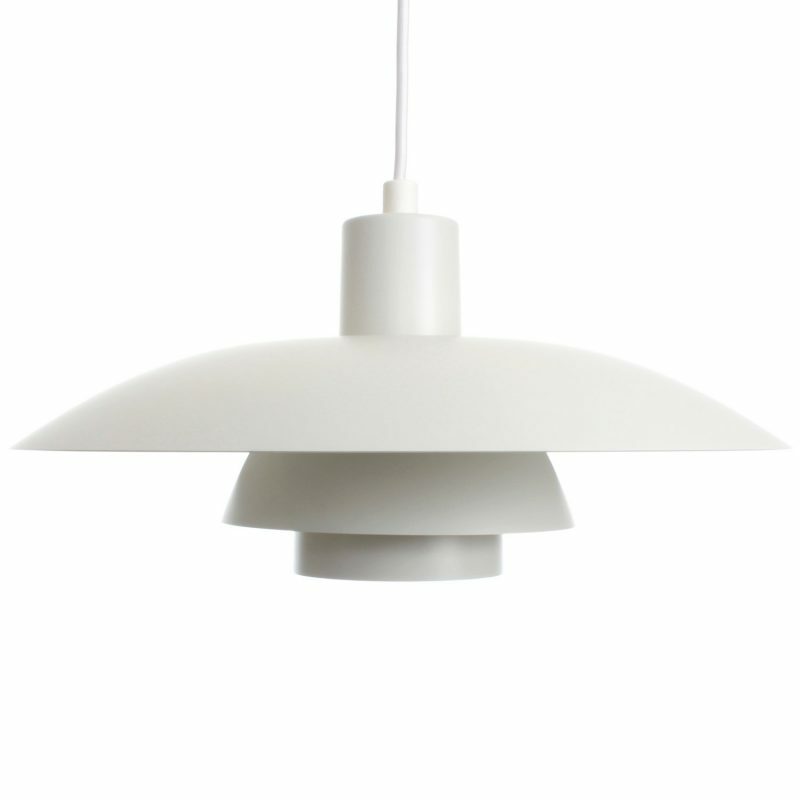 A classic Danish 100% current. 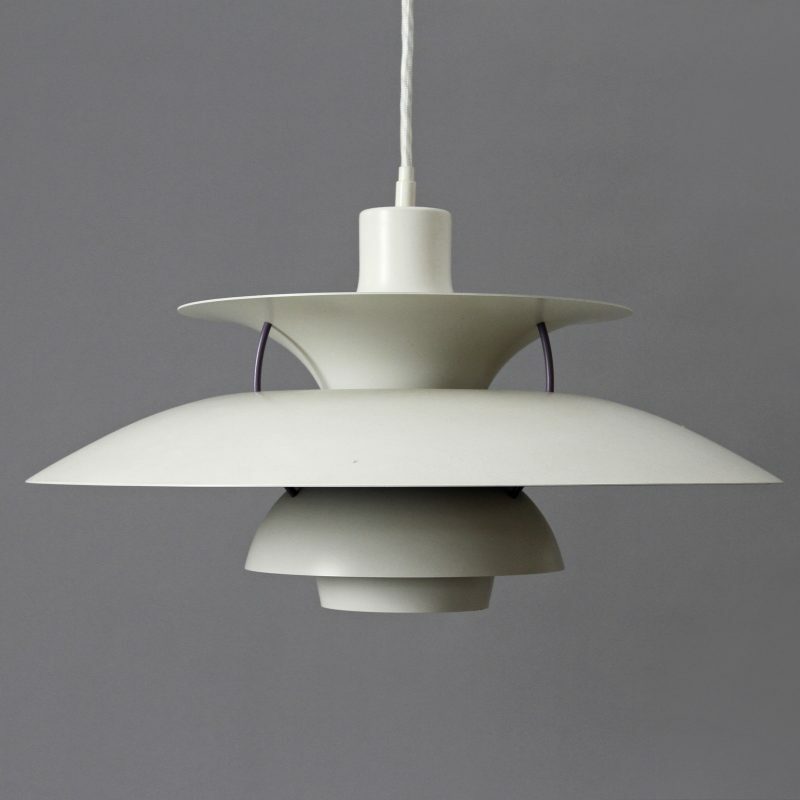 Vintage PH 5 lamp by Louis Poulsen. 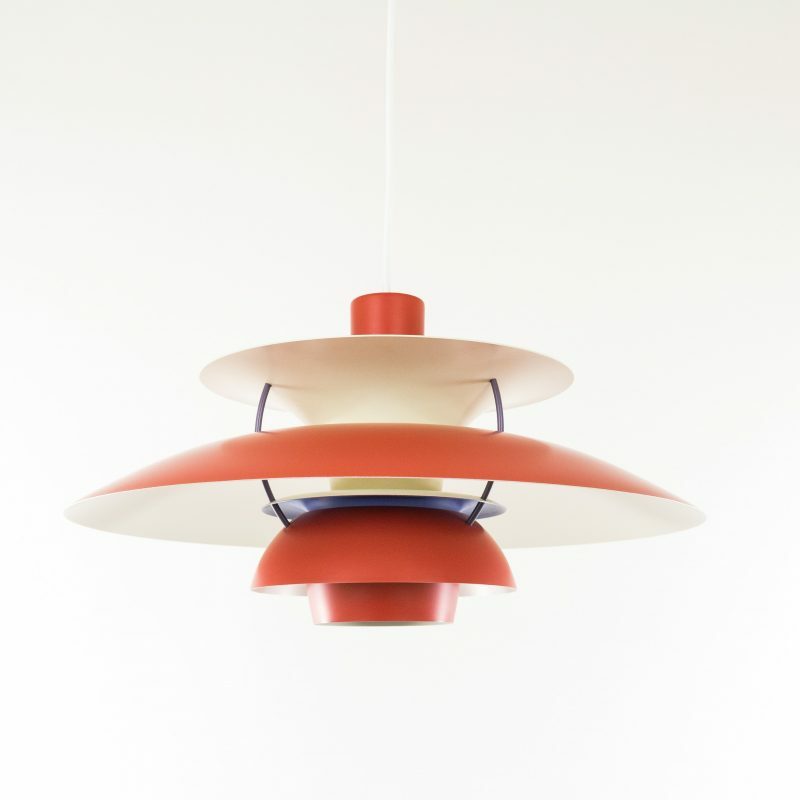 Poul Henningsen designed it to diffuse softly light. It is lacquered in red color. A classic Danish 100% current. 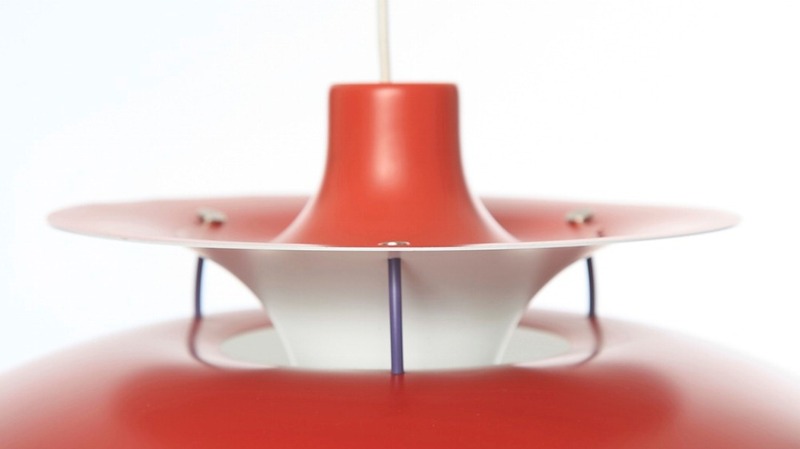 Vintage PH5 lamp by Louis Poulsen, original design by Poul Henningsen to diffuse softly light. 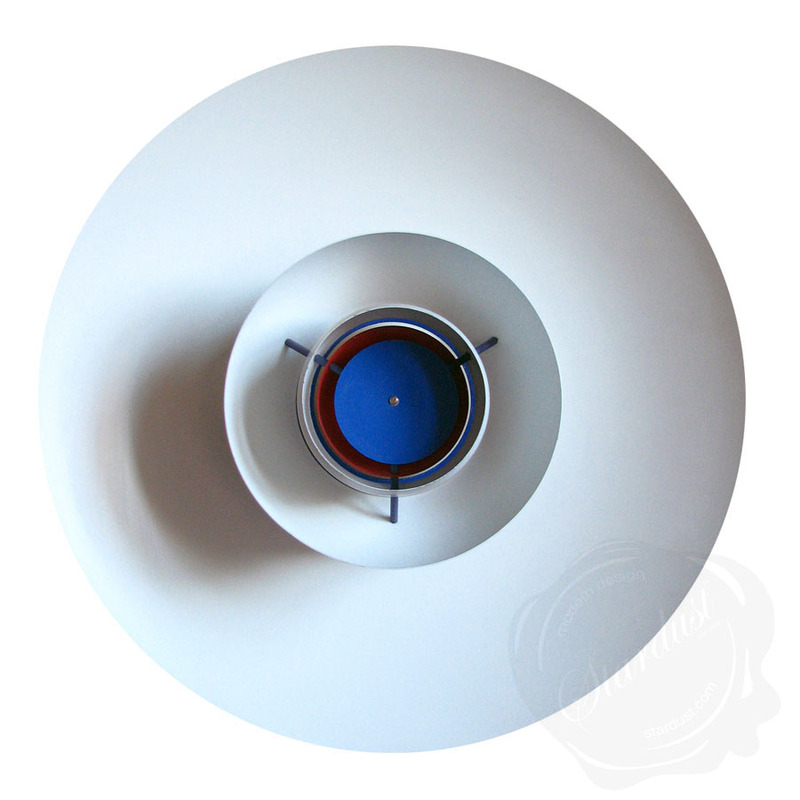 It is lacquered in white. 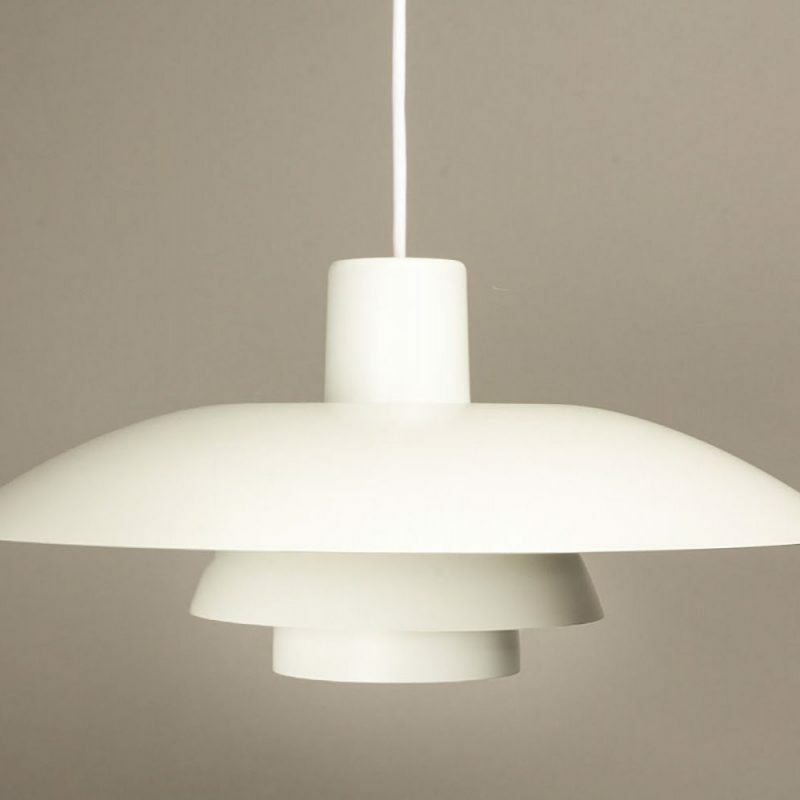 A classic Danish 100% current. 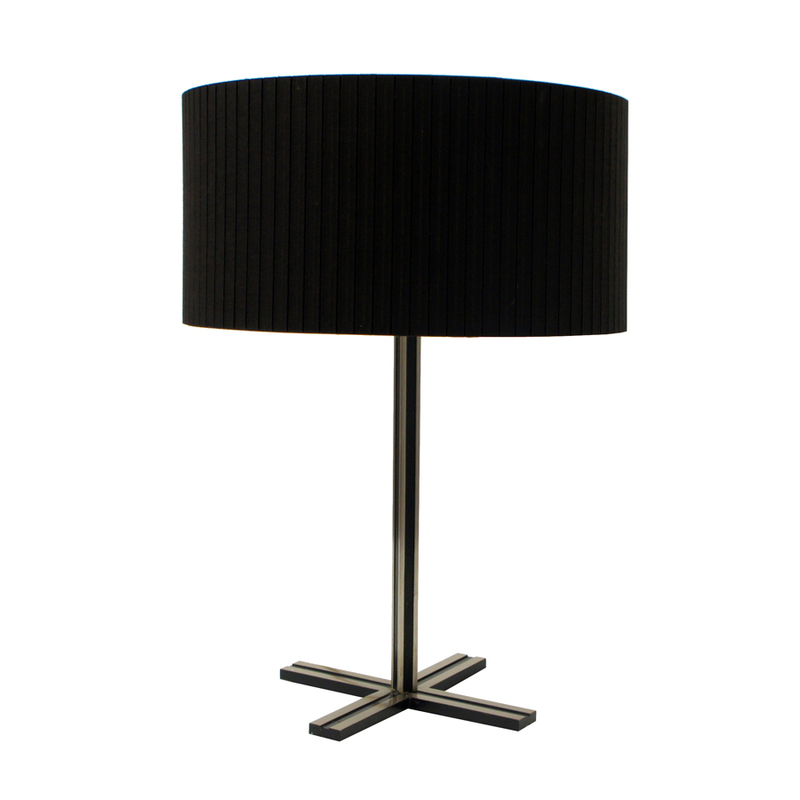 German table lamp with a grey laquered metal shade, adjustable, set on a metal base. 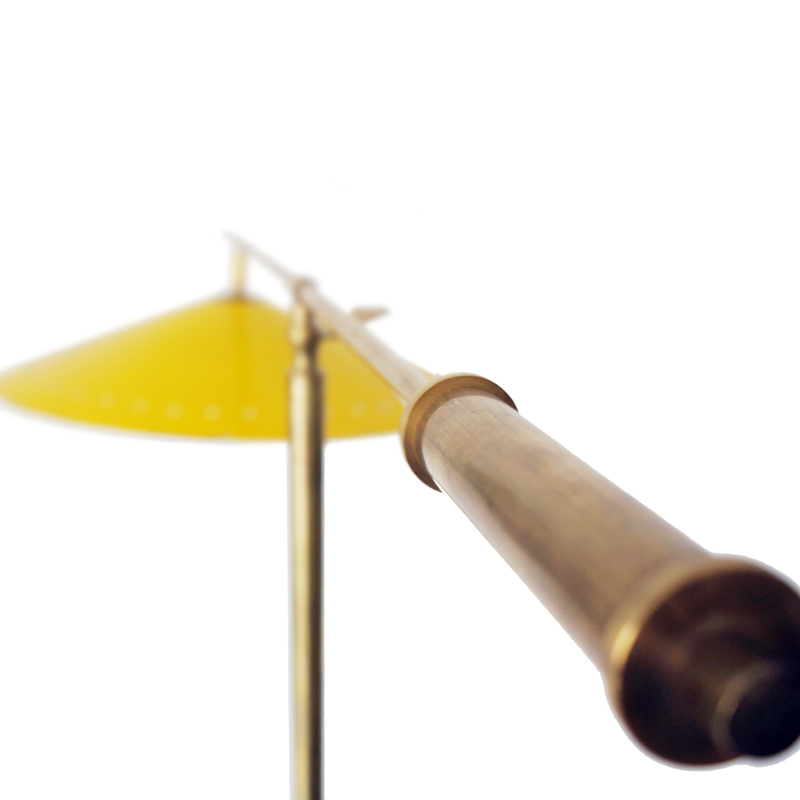 It is a lamp from Bruno Leuschner' Economy School in Berlin. 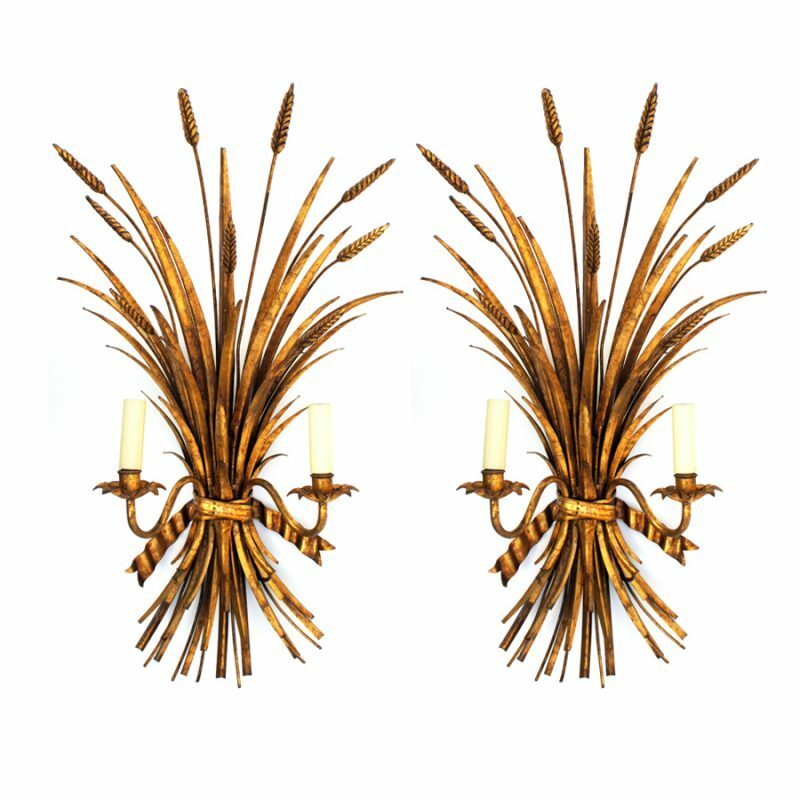 This pair of palm tree sconces originates from the 1970s and was designed by Hans Kögl in Germany. 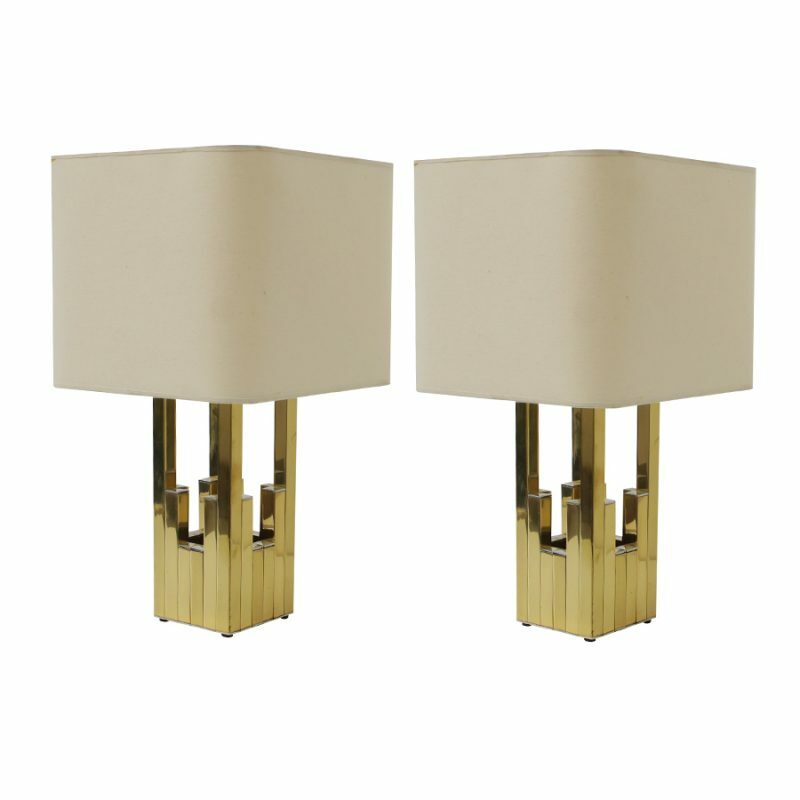 Both pieces are made from gold-plated metal and have one socket. 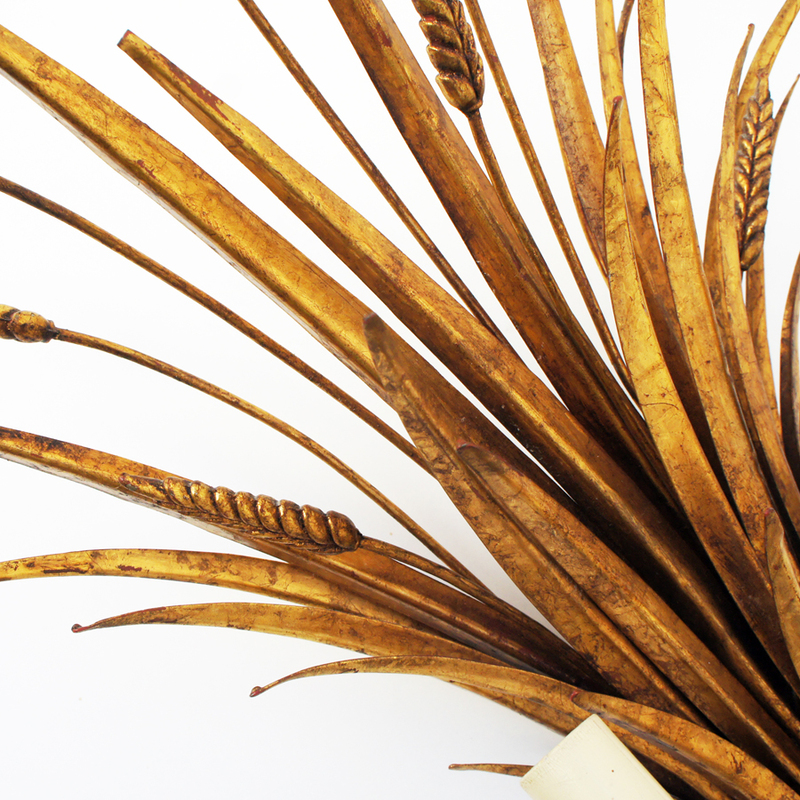 This pair of wheat shaped sconces originates from the 1950s and was designed by Hans Kögl in Germany. 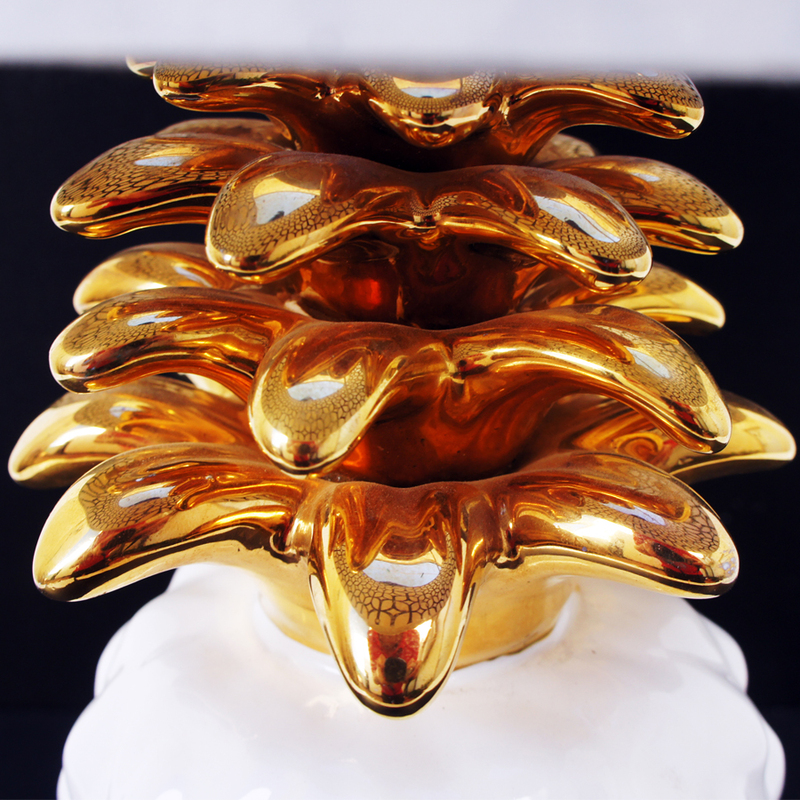 Both pieces are made from gold-plated metal and have two sockets. 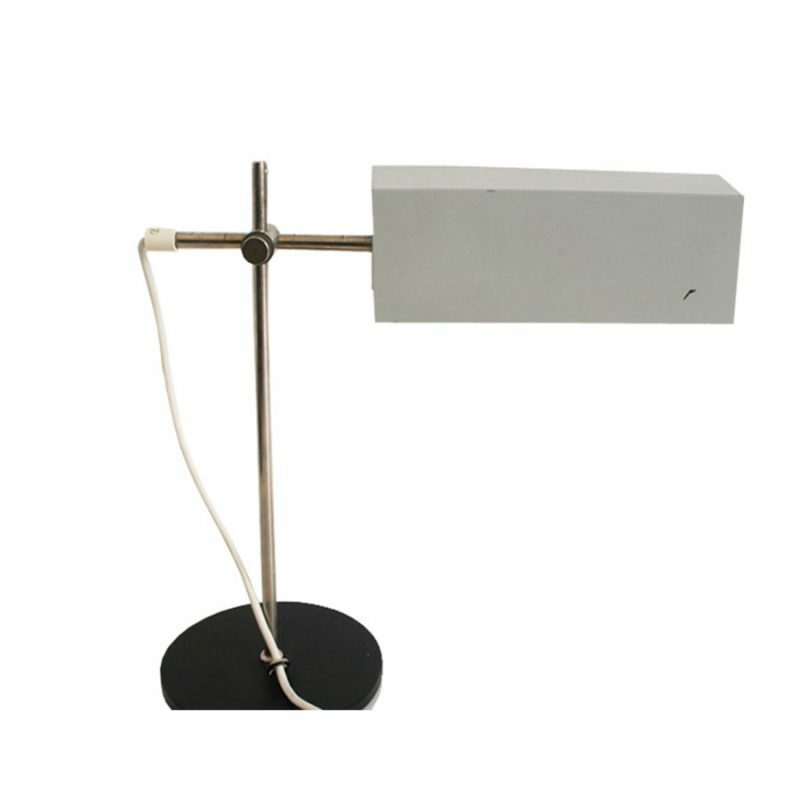 This table lamp was designed by Christian Dell in a Bauhaus style. 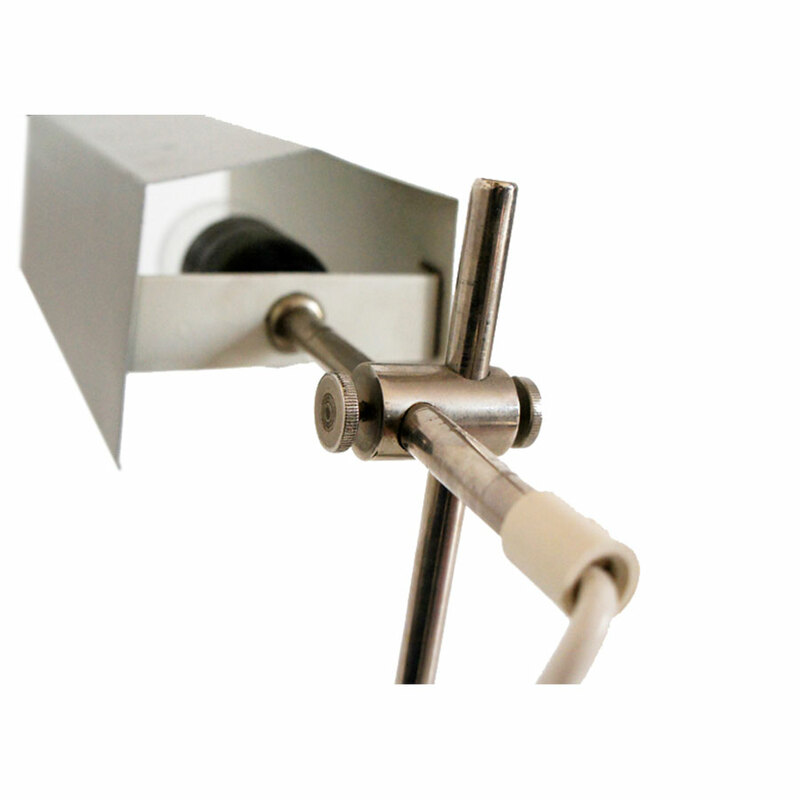 It features a body made in aluminum and black lacquer. 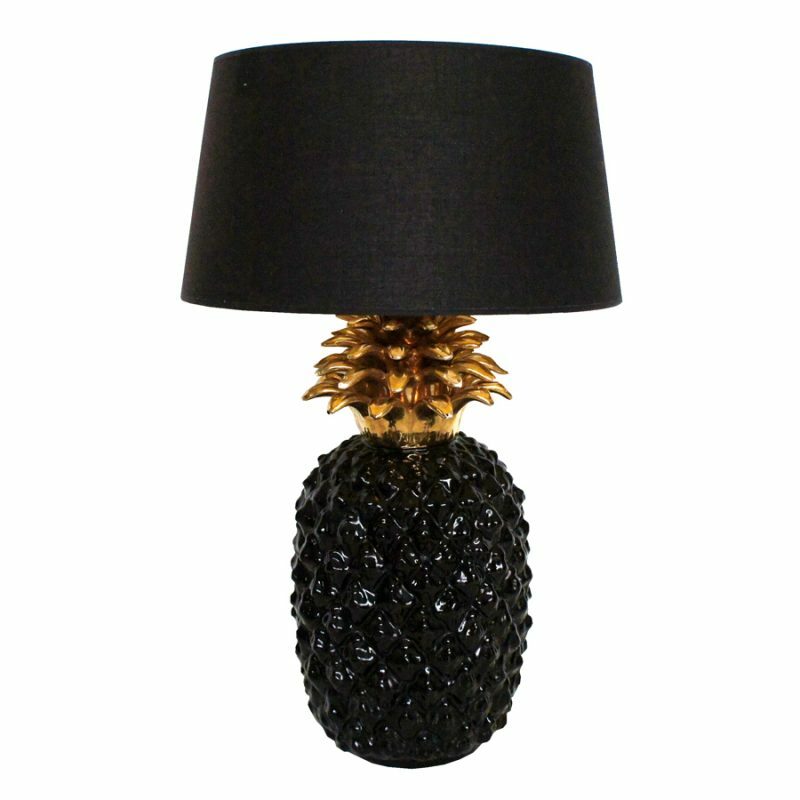 The lampshade is made in pleated black cotton. 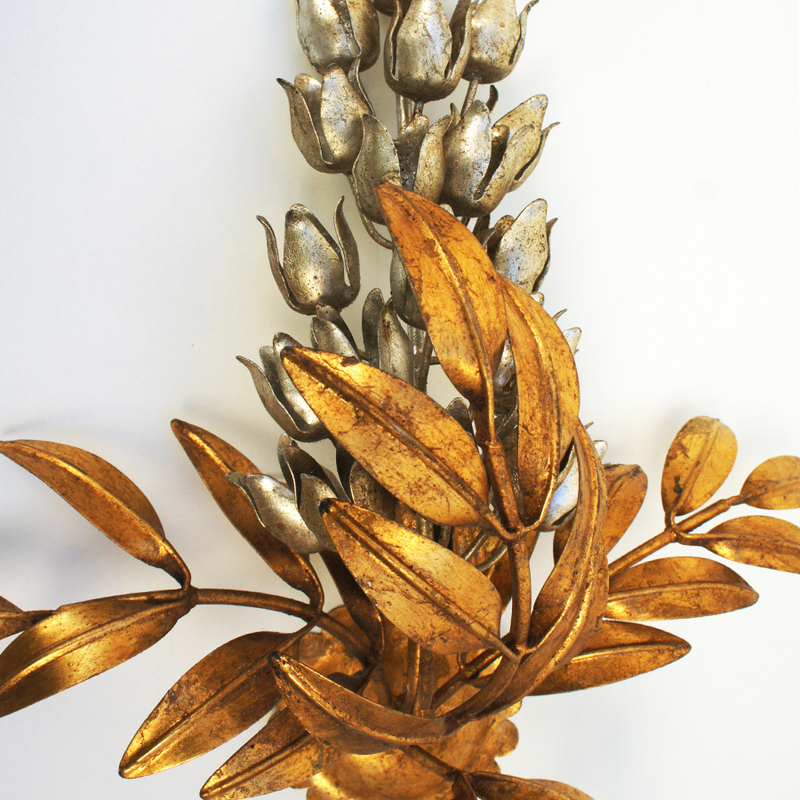 This Italian brass floor lamp was manufactured in Italy by Arteluce in 1954. With marble base, adjustable brass stem and a beige and white lacquered metal shade. This item is in a very good vintage condition. 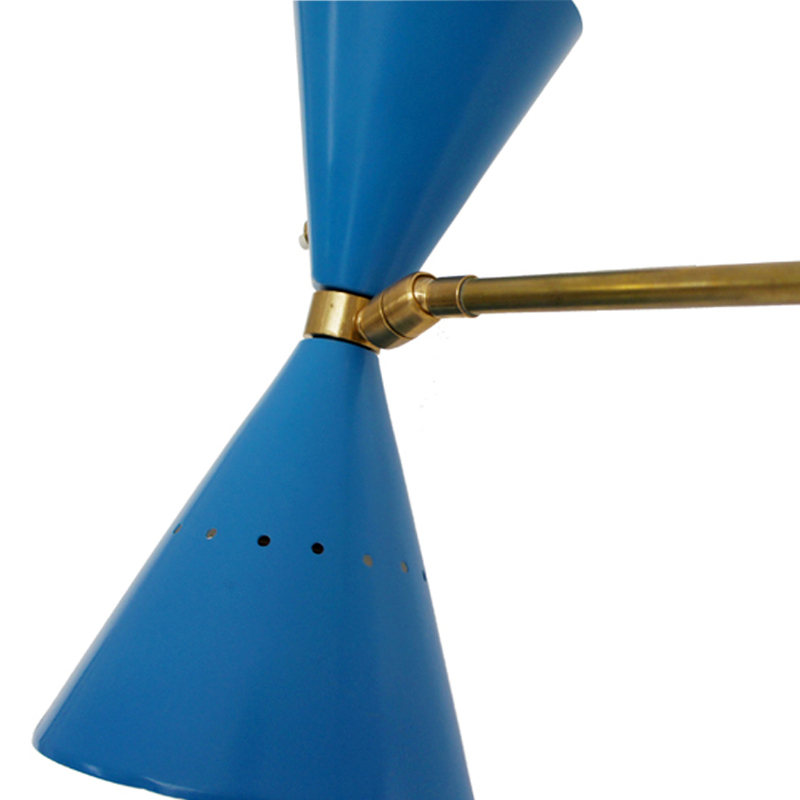 Pair of modernist table lamps designed around 1970 by Willy Rizzo for Lumica. 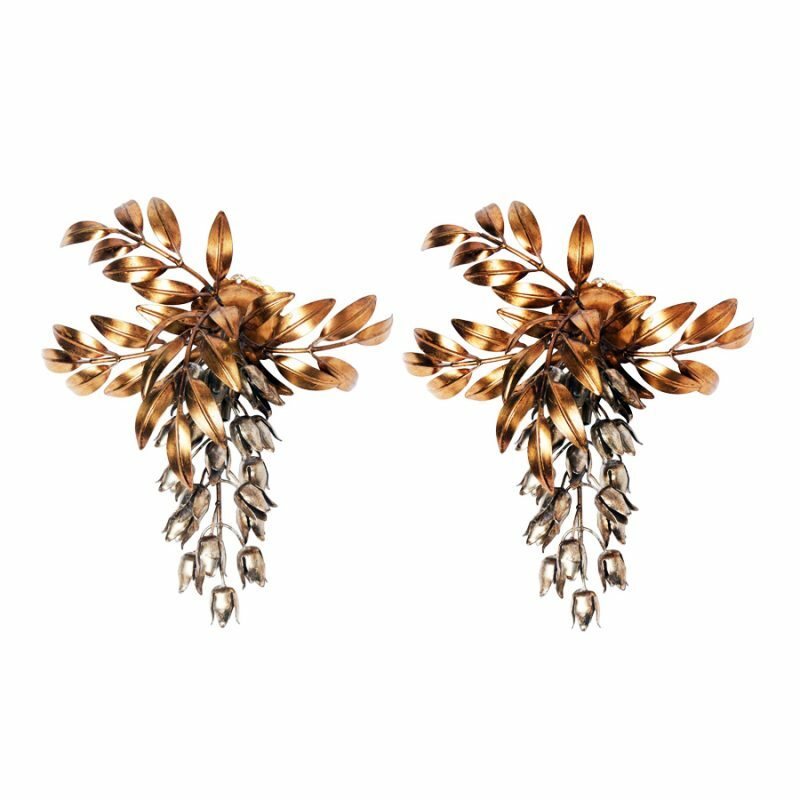 Made from golden metal with beige cotton shades. 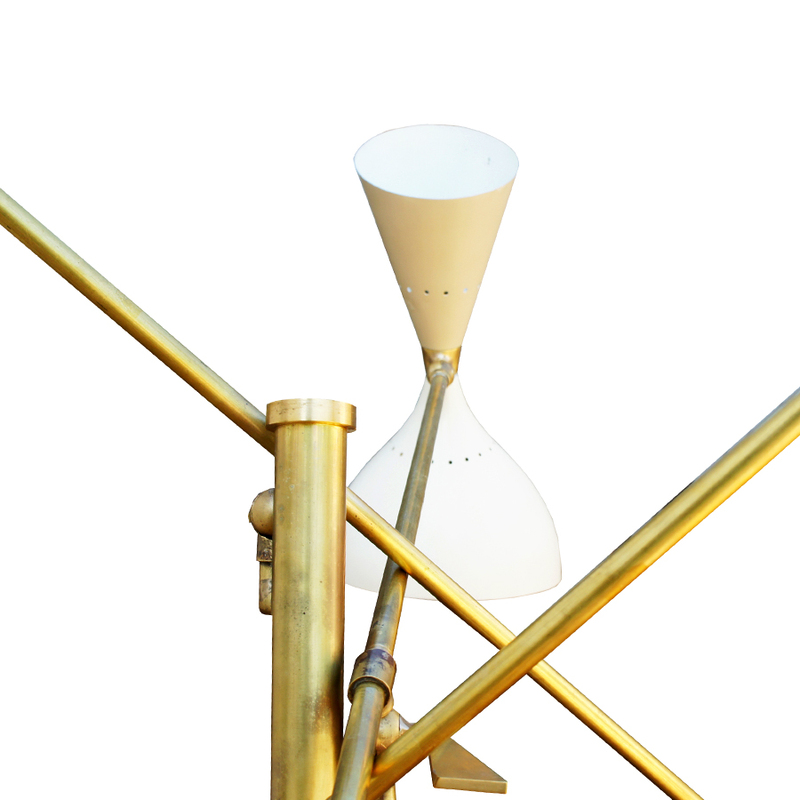 This Italian brass floor lamp was designed Gisueppe Ostuni. 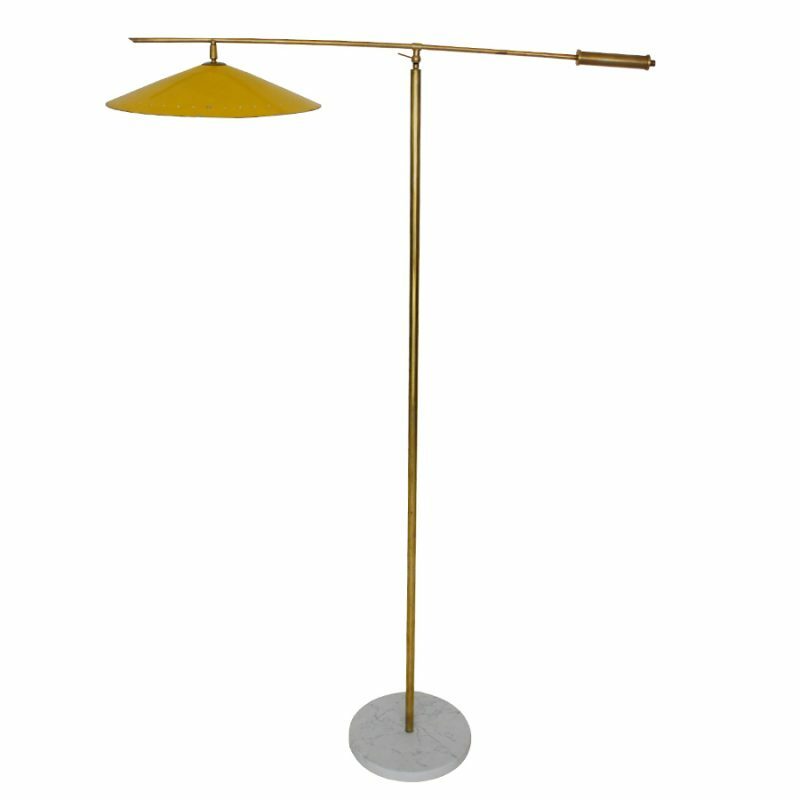 With marble base, adjustable brass stem and a yellow and white lacquered metal shade. This item is in a very good vintage condition. 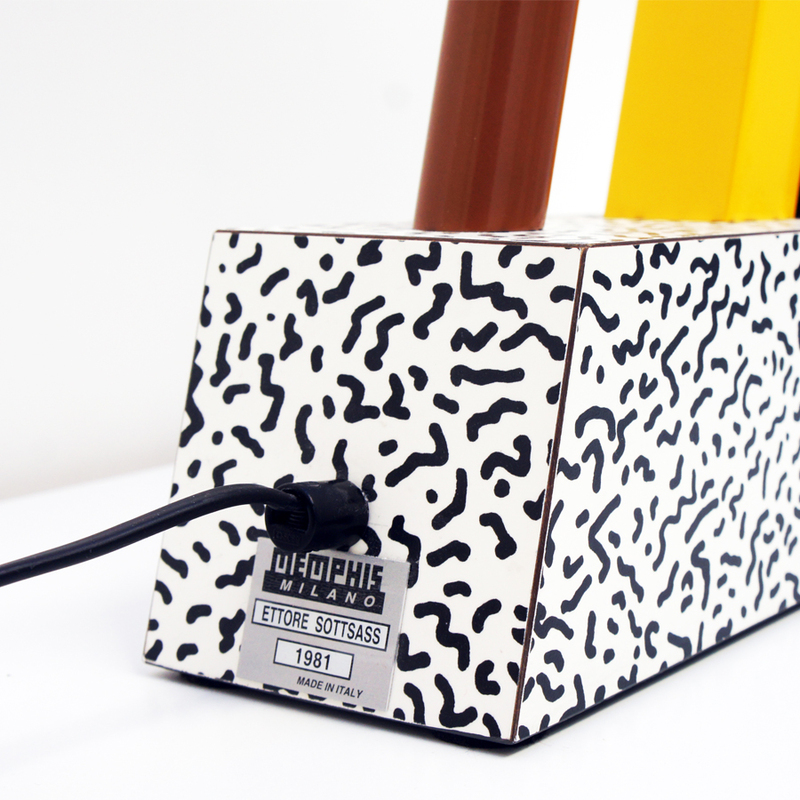 This Tahiti table lamp, designed by Ettore Sottsass for Memphis Milano, is made from metal and laminated wood. 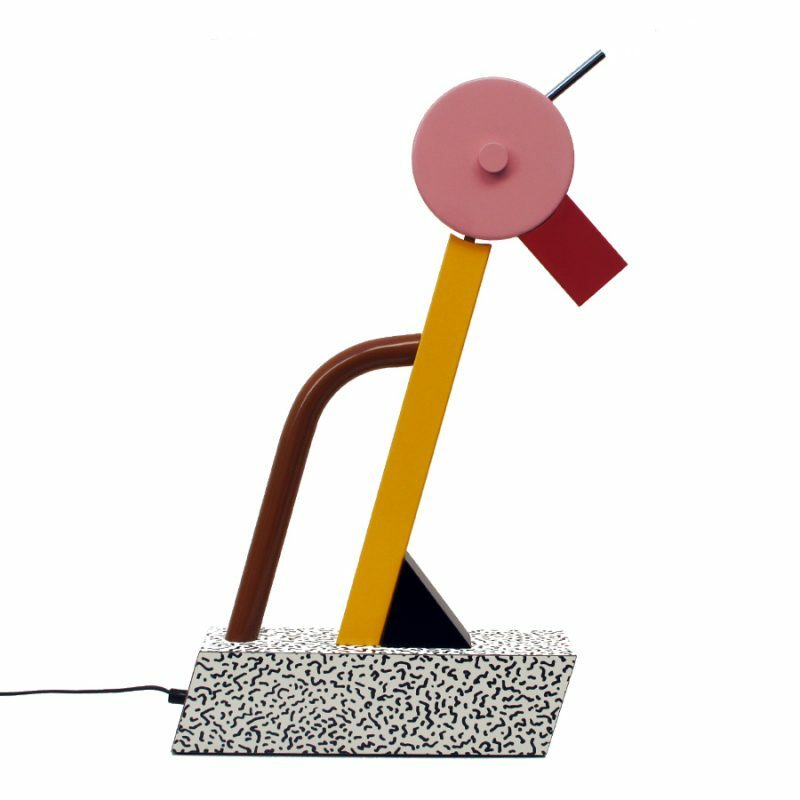 The lamp is multicolored and has the shape of a bird. 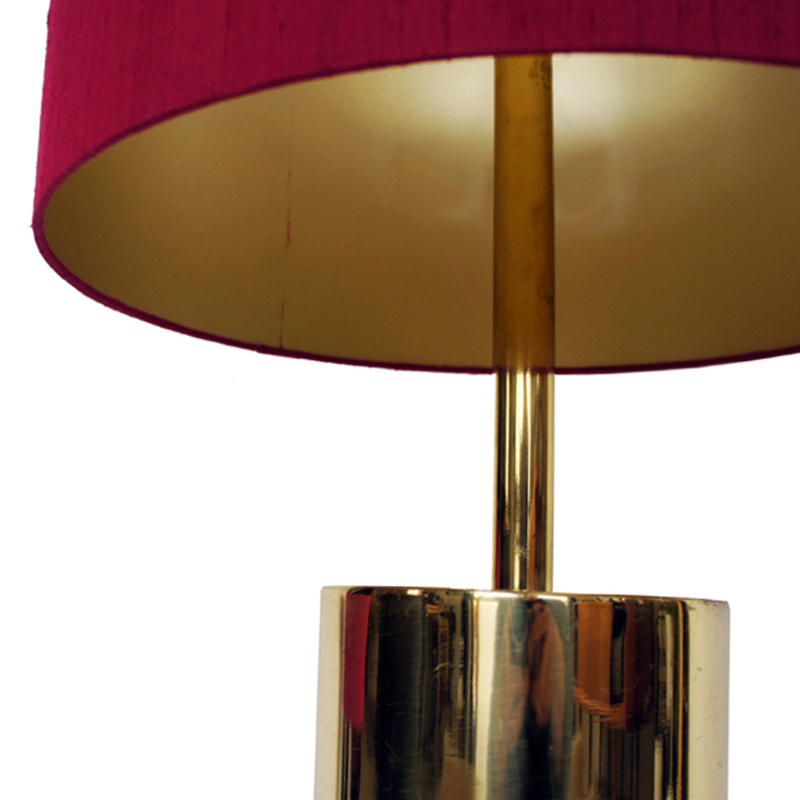 This large table lamp was made in the 1970s in France. 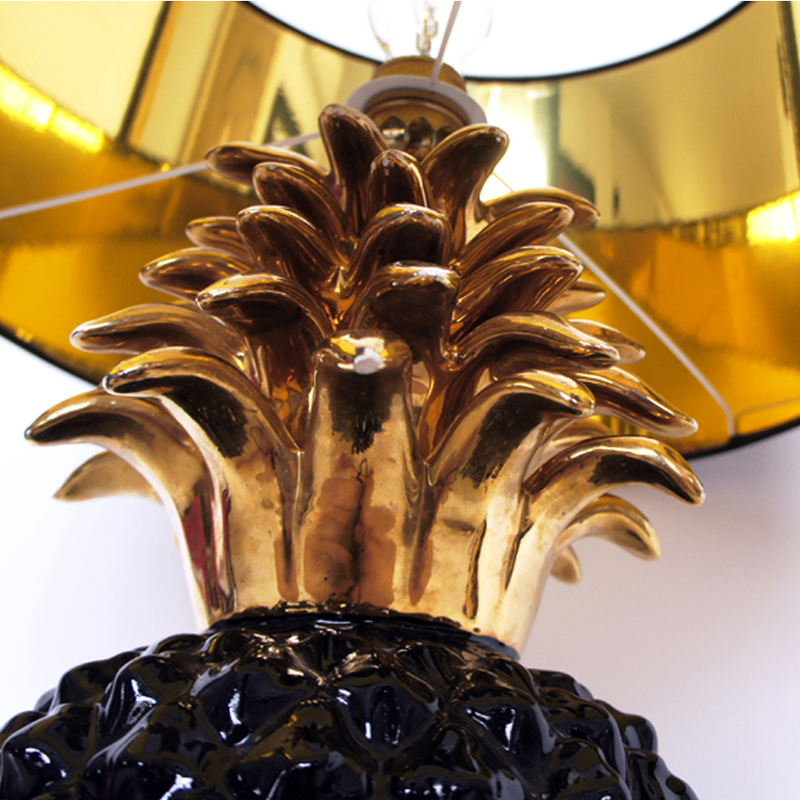 The base is shaped like a pineapple and made from black and gold ceramic. 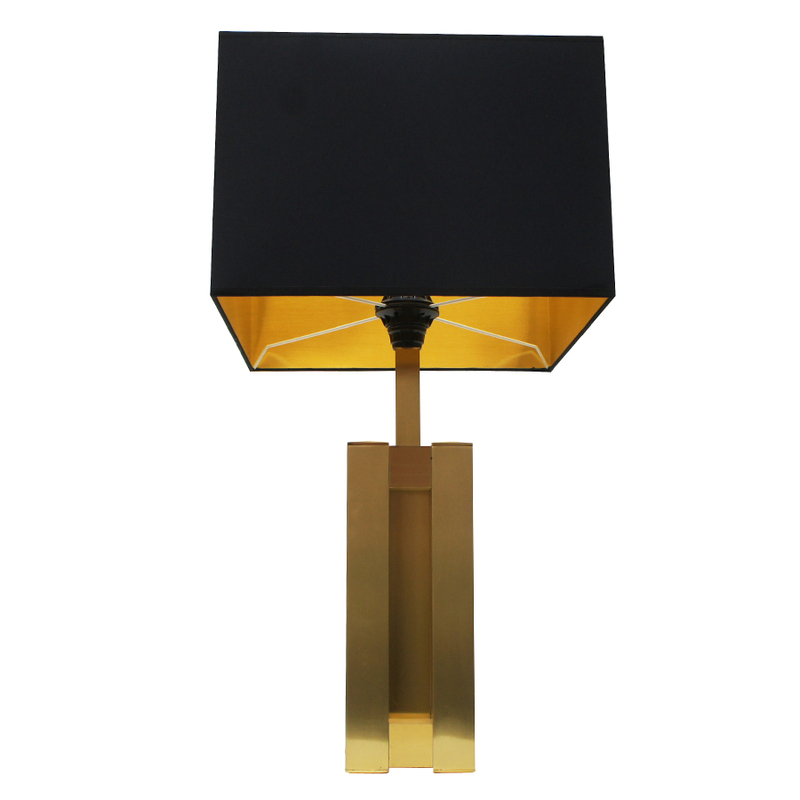 The black lampshade is made from silk and has a golden inside. 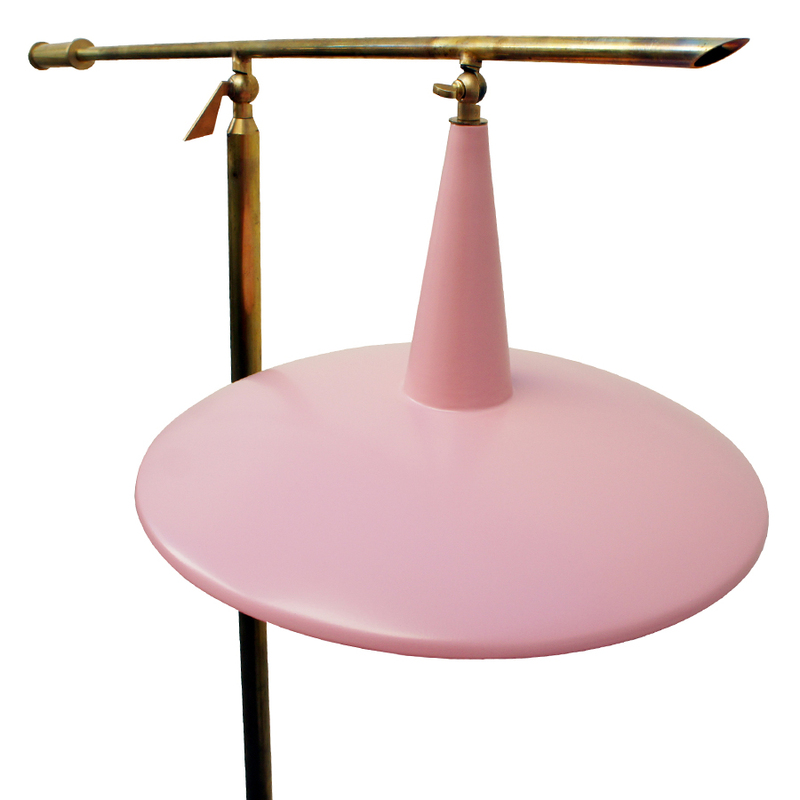 This table lamp was made in the 1970s in France. 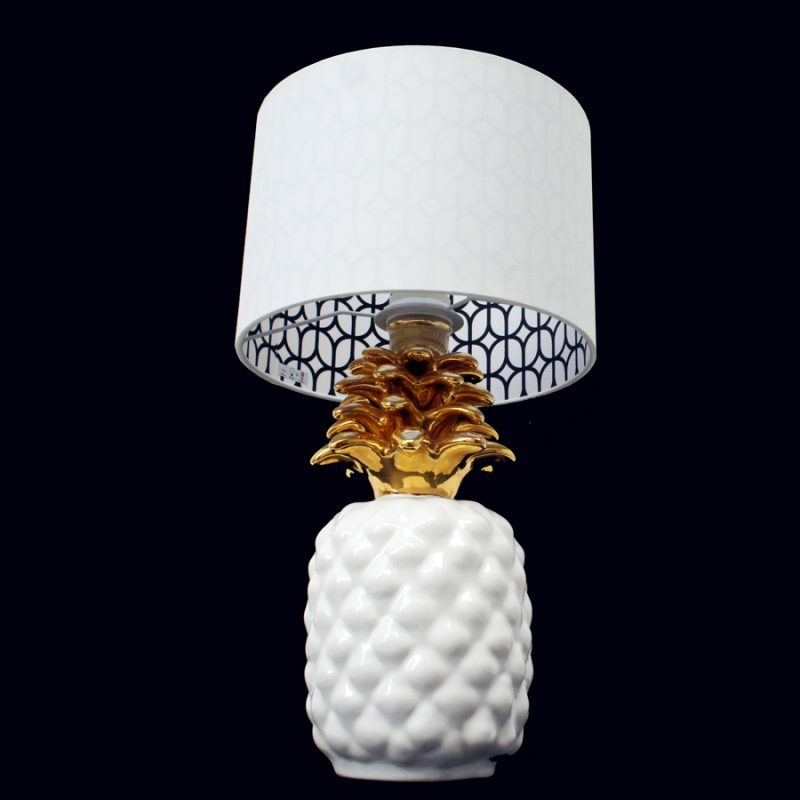 It features a pineapple shaped base made from white and gold ceramic as well as a beige lampshade with golden details. 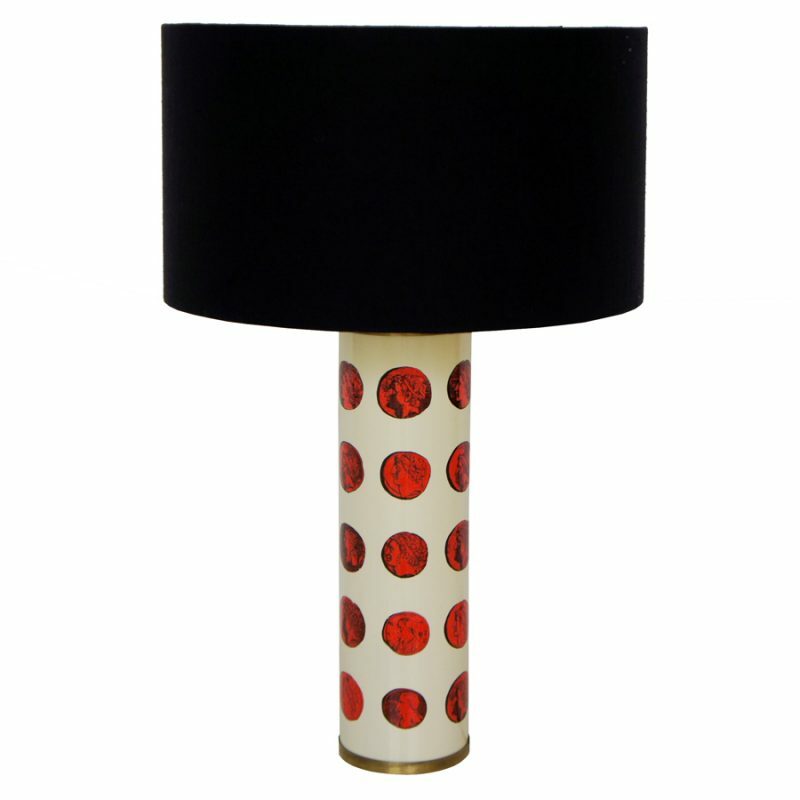 This lamp was designed by Piero Fornasetti and manufactured in Italy in 1950. 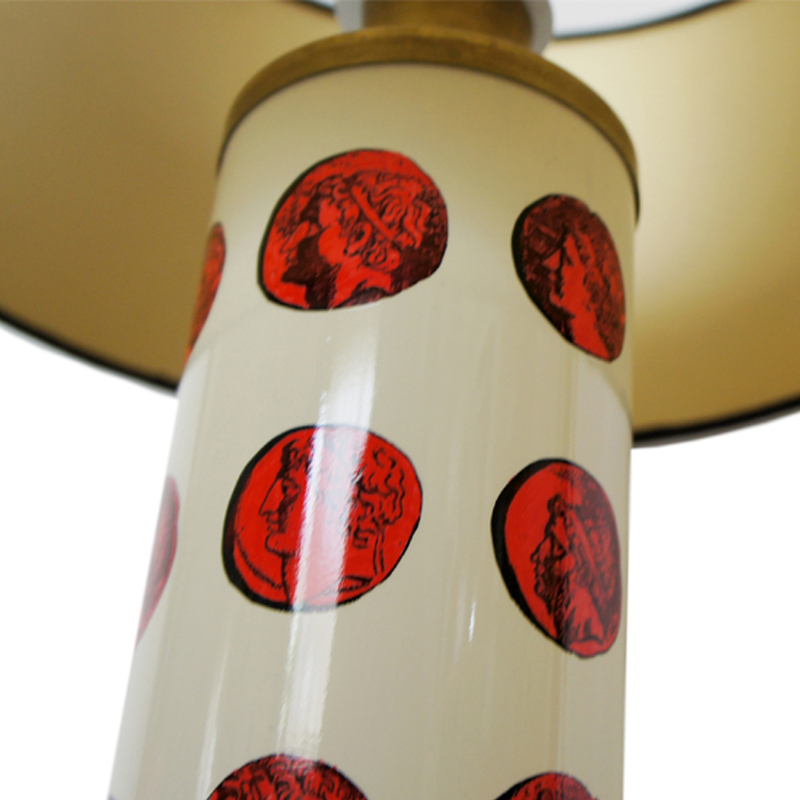 It is made from white enamel with gold transfer printed lithograph cameos of emperors with brass details. 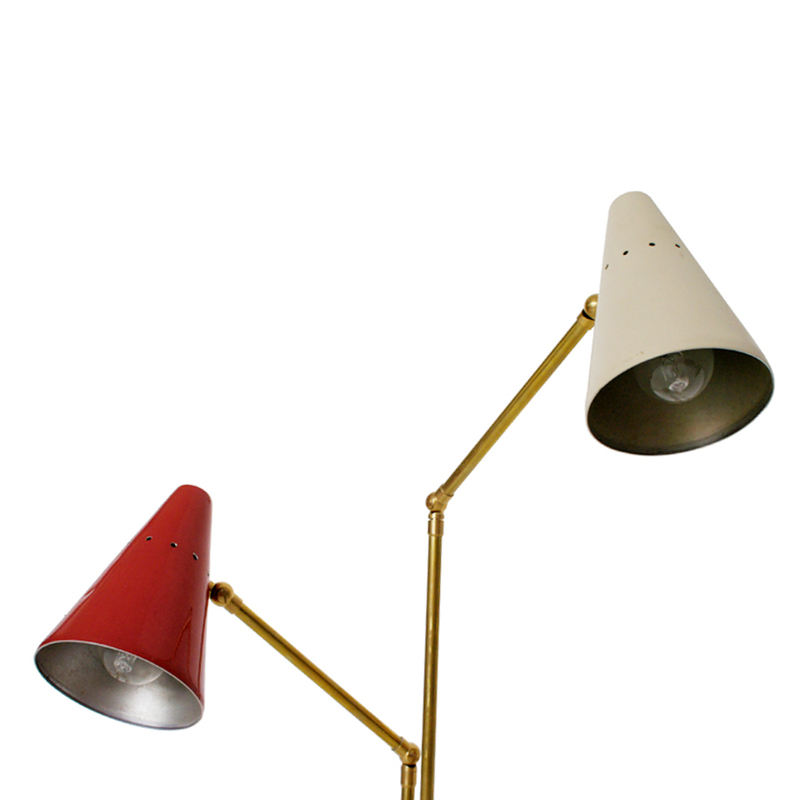 The lamp is labelled on lamp base, it has been rewired and is in very good vintage condition. 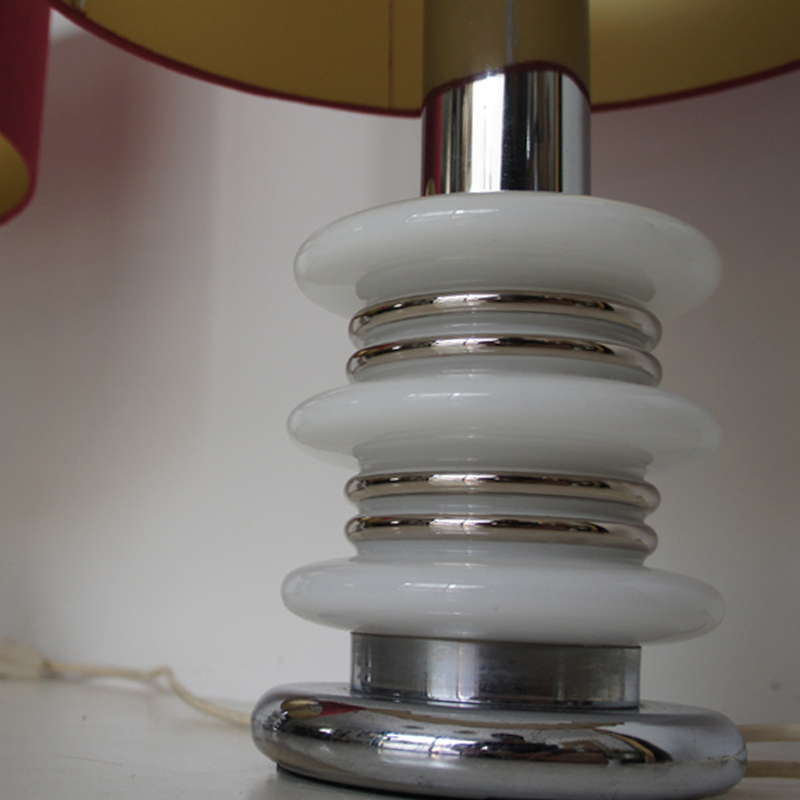 Dimensions given are without lampshade. 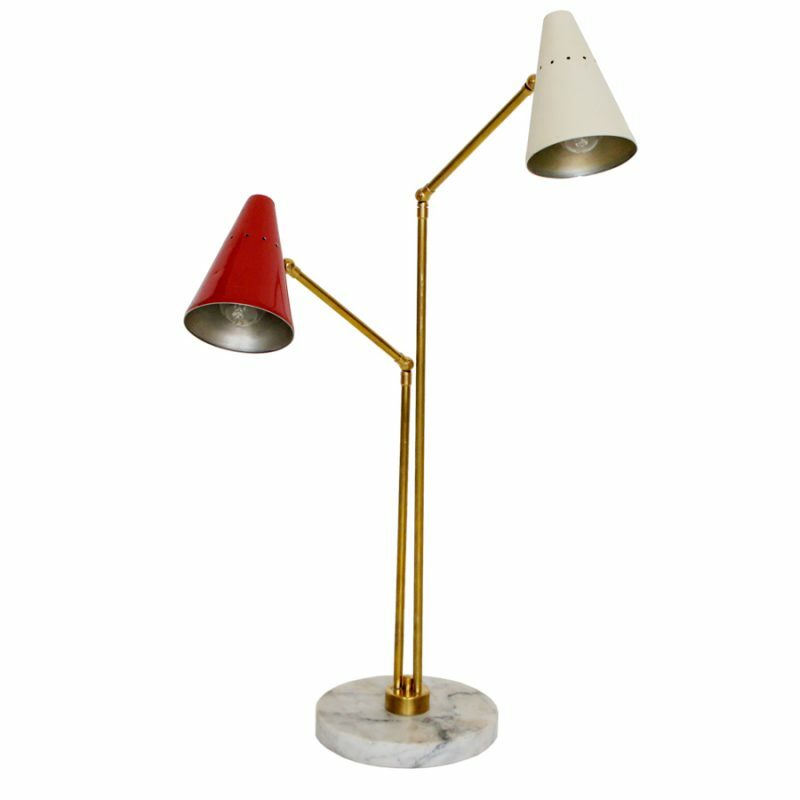 Large table lamp made in the 1950s by Stilnovo. 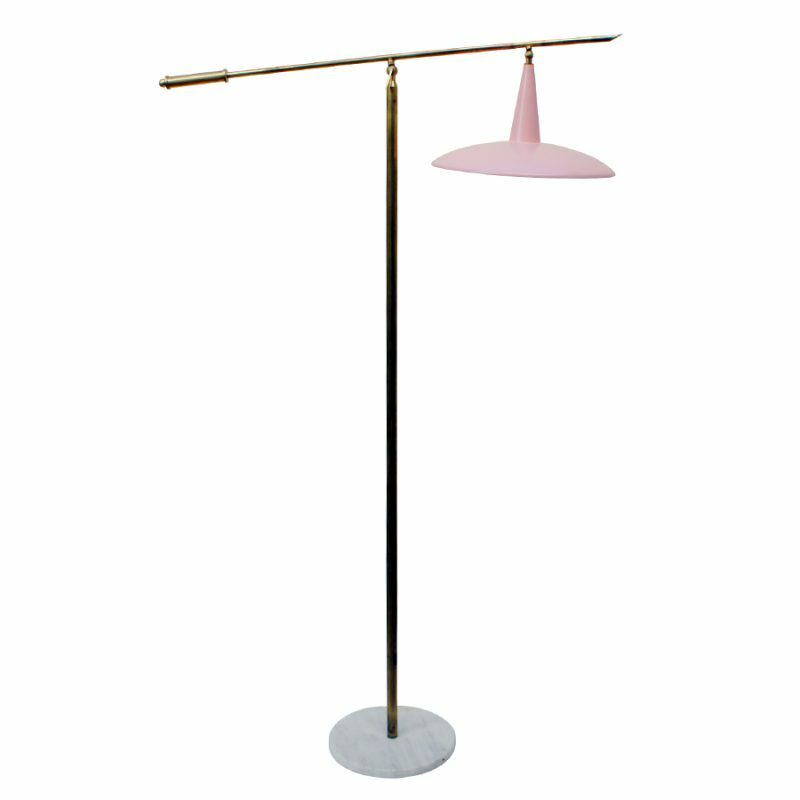 Two rods standing on a marble base featuring two adjustable lights. 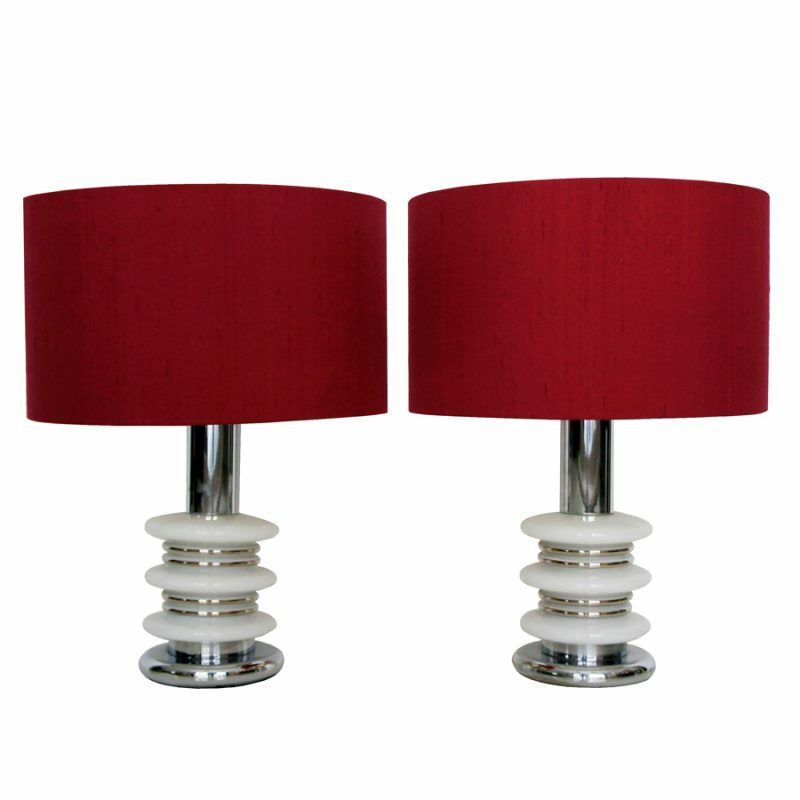 Perforated steel sheet, beige and red lacquered lampshades. 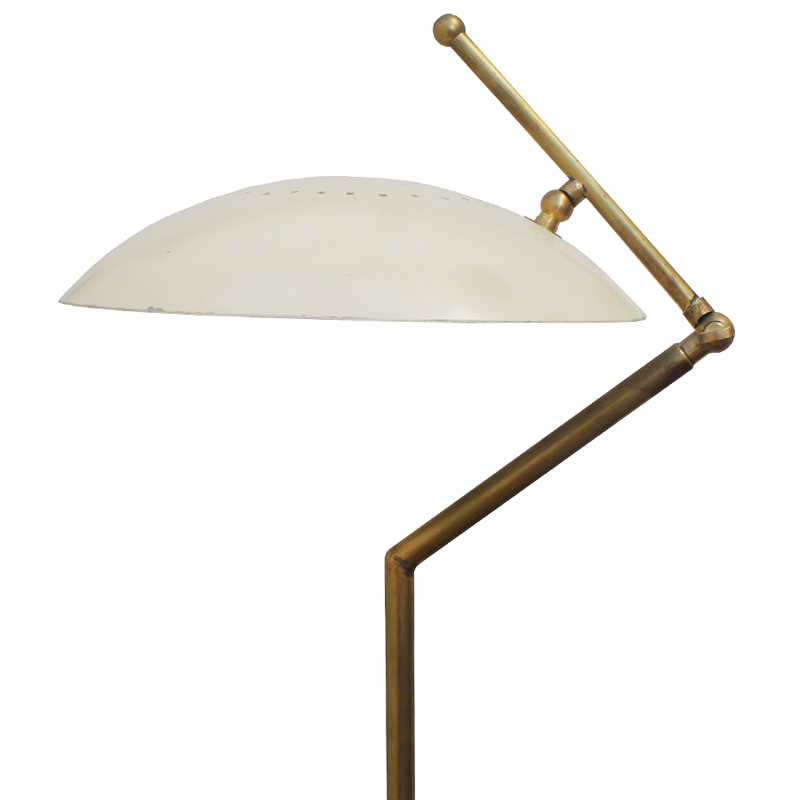 This Italian brass floor lamp was manufactured in Italy by Stilux in 1950. 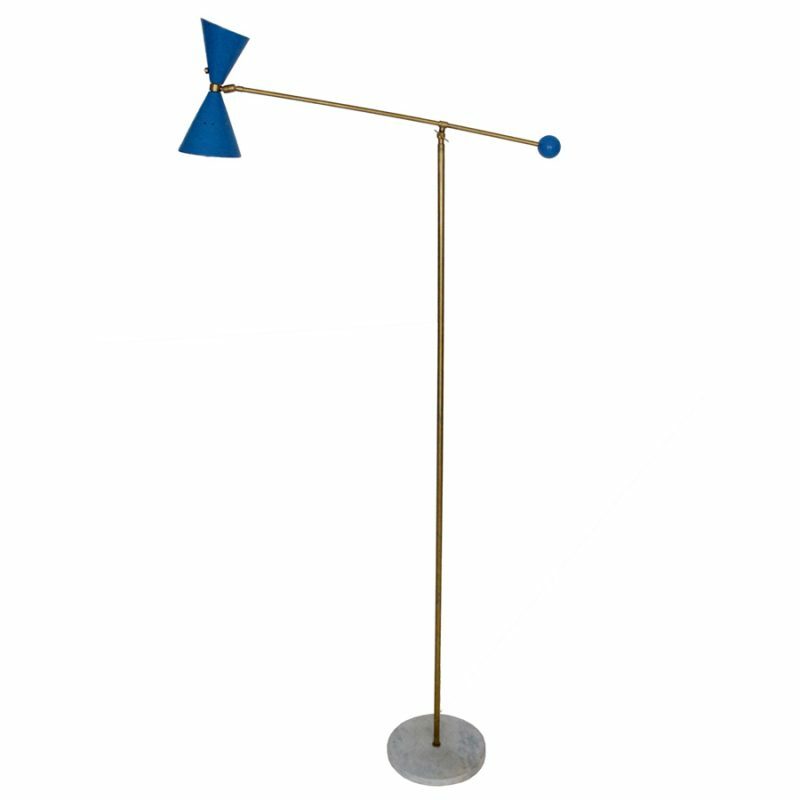 With marble base, adjustable brass stem and blue and white lacquered metal shade. 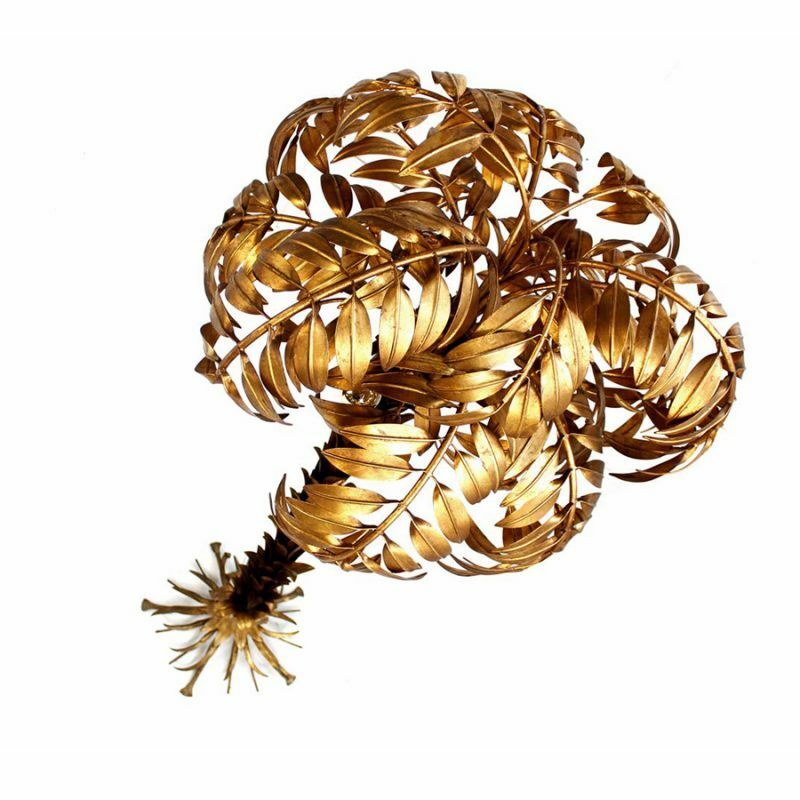 This item is in a very good vintage condition. 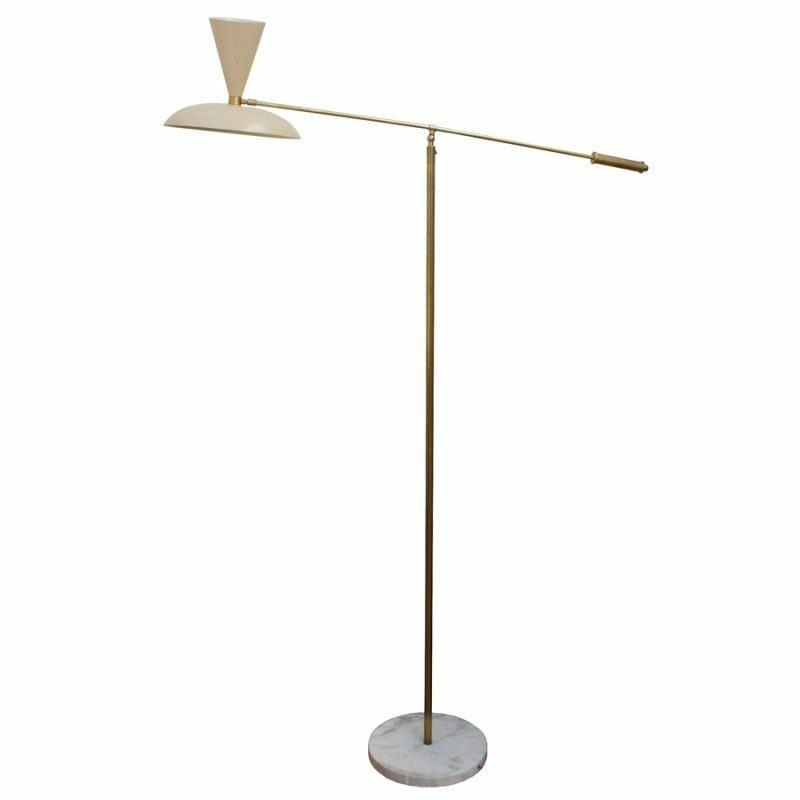 This Italian brass floor lamp was designed by Giuseppe Ostuni . 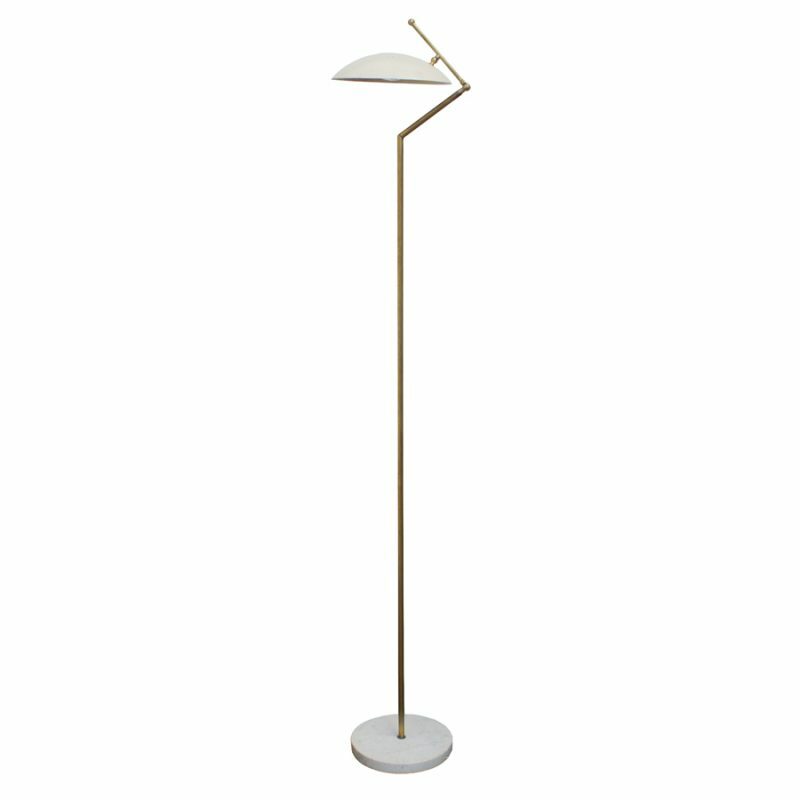 With marble base, adjustable brass stem and a beige and white lacquered metal shade. This item is in a very good vintage condition. 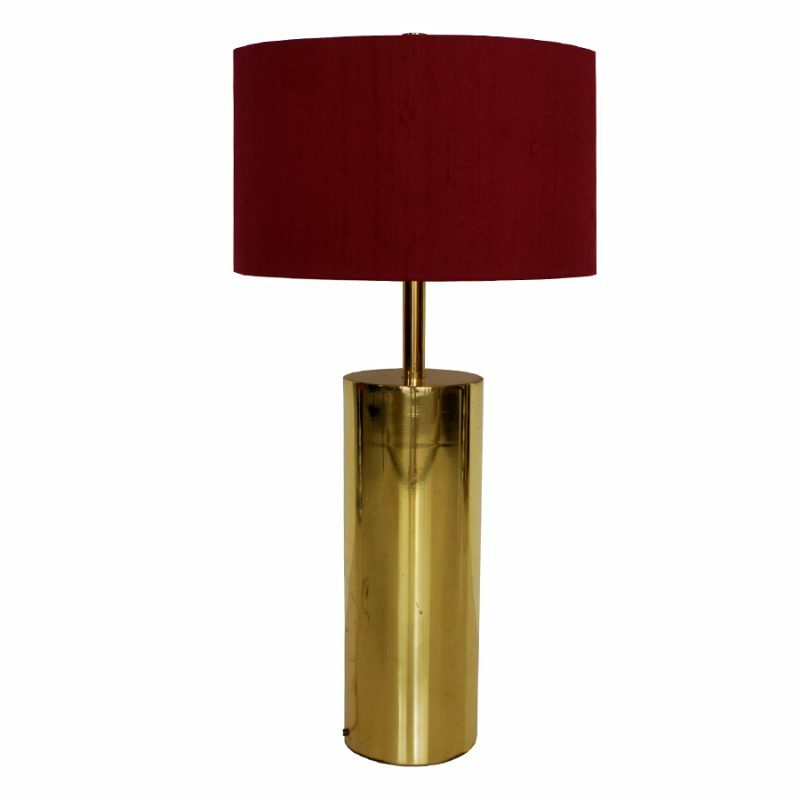 This large table lamp has a fuchsia silk shade. 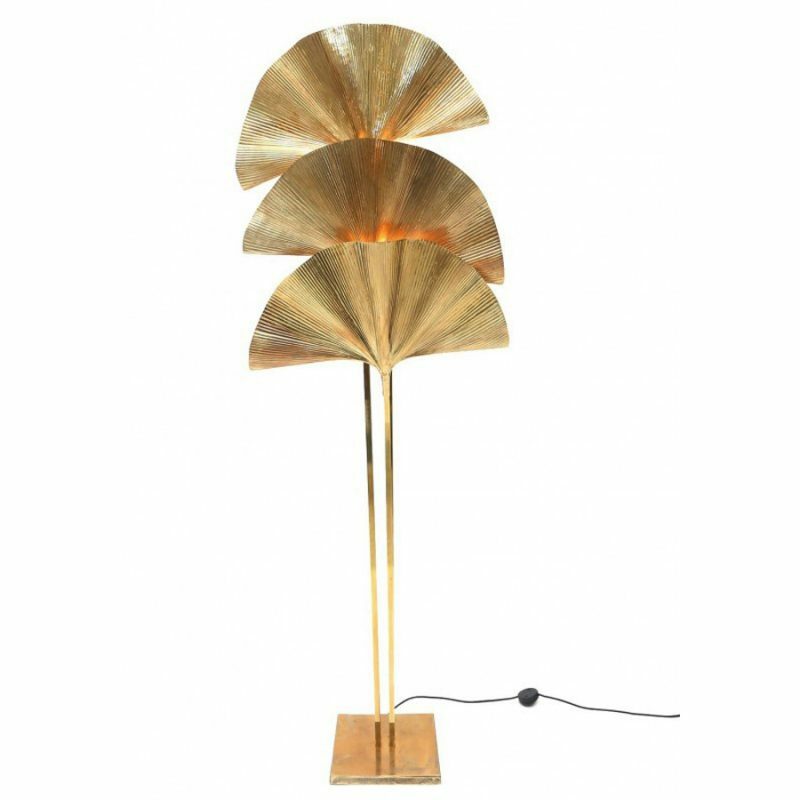 This Gingko leaf floor lamp is made completely in brass and was designed by Carlo Giorgi (sometimes it is clasified as a design of Tommaso Barbi) in Italy in the 1970s.